Love it - if it's any help, Bonzo and I have done several trips to London and he has loved it each time. Interesting, as as you say, a hand drier is worrying..... but, the noise of London, doesn't seem an issue! I do wonder Claire if you might be right. I think we might be able to take him to somewhere like the science museum - straight there, straight back, but we still have to go through the train/tube bit. You were *very* brave taking yours on your own! Starbucks is definitely the way for me to cope with it all, and joking aside, it really is familiar for Mini, so is worth us remembering for him too! Don't know Mini, obviously but just to let you know it CAN be done! We did this with our adopted boys last year, and it worked. They are 8 and 5; we went to London, travelling by train. I admit it was hard work, and they got very over excited - Pup, my eldest gets very hyper and silly when he's anxious in new situations, and can be extremely challenging, and Tigs the youngest is borderline ADHD. We decided to only do 2 activities, that seemed like enough, so we did the London Eye and the Science Museum. We planned the day carefully and told them what we were going to do, how we were travelling, where we would eat etc; and we hung onto them on the trains and tubes. One thing we have found is that their behaviour in new situations is a thousand times better when we are with them; Don't know if Mini is the same, but if he is, might it be easier if you both go? If that was possible. As for the noise, you may be surprised. Pup used to have major issues with noise, he'd vomit if exposed to unexpected loud noises, and he is still pretty noise sensitive, but he did not turn a hair, even at the underground trains. We did prewarn him! NB the Science museum gets very busy, especially the child friendly areas. I can see why taking a 22 monther might not be good! I can't remember exactly, but I think we 'drip fed' info about what it would be like. E.g. Day 1 - London is REALLY big! With my boys it seems to go in better if we tell them a little at a time; just dropping comments into conversations over the week or two before the trip, showing the odd picture etc. So many good tips and advice already! I love this post. The thinking "outside the box" with children who have tough times processing things/surroundings. Not many would cleverly mark Starbucks as therapeutic for a child, but you realize its benefit to little Mini! well done! We've toyed with the idea of heading up to the big smoke but aren't sure how Katie would feel about it and how the crowds etc would feel to her. She can get extremely silly when overexcited. You can drive easily to the science museum though. We did it with some friends and managed to park relatively close by. It might be worth going on a weekday rather than a weekend. I would definitely agree that you go too and like the Starbucks idea. It's what I was writing about re our holiday and having that familiarity. Does Mini use an I-pod or DS? That might help coccoon him a bit on the train. We do short journeys on our local train, just to our nearest town so Katie can get used to it. I'm glad to hear that you are getting more coping strategies together and feeling that this visit might be a possibility in the future. That's really great. Wishing you good luck. The science museum is sounding like one of our best bets - a definite venue to aim for rather than a sight-seeing day. Thanks for the good luck wishes too...perhaps one day we'll see you and Katie at the science museum! I think using Starbucks as a common, familiar soothing environment makes perfect sense. It is giving him somewhere that barring Starbucks shutting down, he could go to many different countries even and find something familiar and comforting. When dealing with kids with high anxiety, sometimes you have to think outside the box and just do what works. 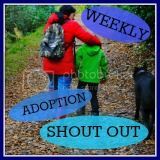 Thanks for linking with Adoption Blog Hop!